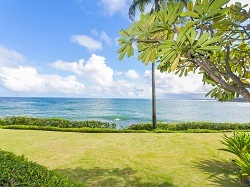 Wailua Bay View condo, beach resort home in Kauai - You will find yourself right on the ocean and far from the highway! Sit and relax on your private lanai while watching the waves roll into Wailua beach. The view is truly spectacular. Many guests have shared stories of watching whales breach on the ocean surface for hours at a time right from the lanai. These ground floor units are just steps from the pool and barbeque area. The private lanai is complete with railing for extra security . This makes a perfect set up for families either with or without children, with no stairs to lug up suitcases and groceries. Our condo comes with a fully equipped kitchen and washer and dryer in the unit. We also offer free wireless high speed internet, a huge brand new LCD 50 inch flat screen TV, cable TV, Blu-Ray player, king-sized bed, a sofabed, a single futon and even a pack and play/crib for little ones. Wailua Bay View Condo Rental in the Islands of Hawaii.